We were pretty hungry, but we were already getting a late start leaving this morning, it was 9:25am when we left the hotel, so we just decided to try and hold out for an early lunch. 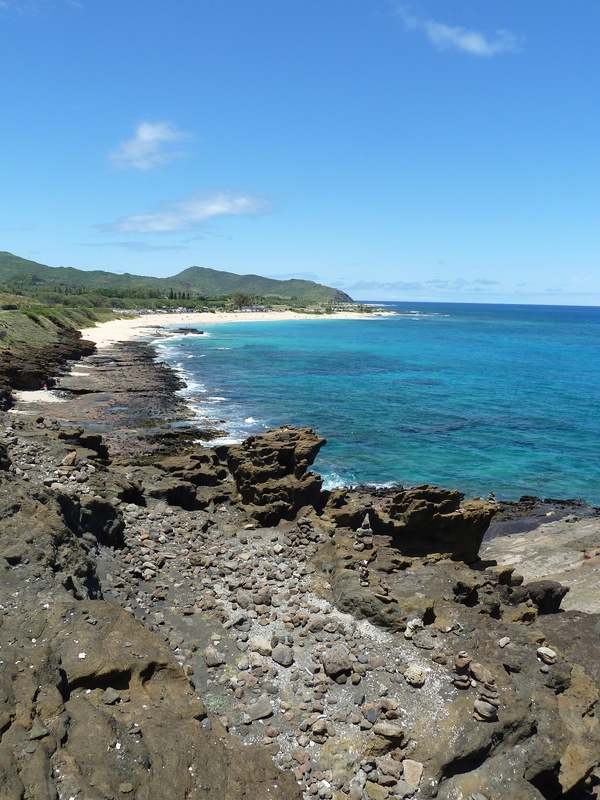 We headed east towards Diamond Head and drove up the coast, passing Sandy Beach (From Here to Eternity Beach) and the blowhole on. We did't use the gps, but rather the map, because we wanted to stay as close to the shore as possible. We stopped at a beach that was recommended to us for 5-10 foot waves, but the surf was not good today, so it looked as though we were out of luck. We decided to head further up north towards North Shore. We were still unsure if we wanted to get ourselves all the way up there, especially if it looked as though the surf was not cooperating today. It was about 10:30am and we were now REALLY hungry. So Matt starts pointing out places, but I didn't want to eat somewhere I could at home, like Taco Bell, but I also didn't want to just try some place blindly. Before leaving I had compiled a list of restaurants that we couldn't fit in to our schedule that I would have liked to try. I compartmentalized them by part of the island. 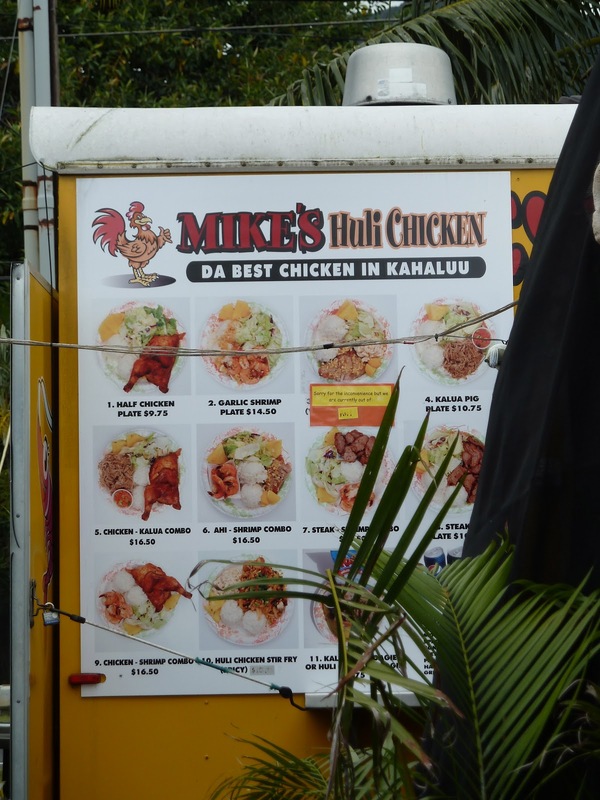 Without even needing to look at the list I thought of Mike's Huli Huli Chicken. A food truck that I thought should be close to us, since I remembered passing it on our first day. SO I start to put it in my GPS, but I happen to look up while I', waiting for my GPS App to open and what do I see? You guessed it! 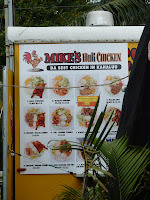 Mike's Huli Huli Chicken. By the way- that translates to something totally different in Russian. Wow. This place is amazing. 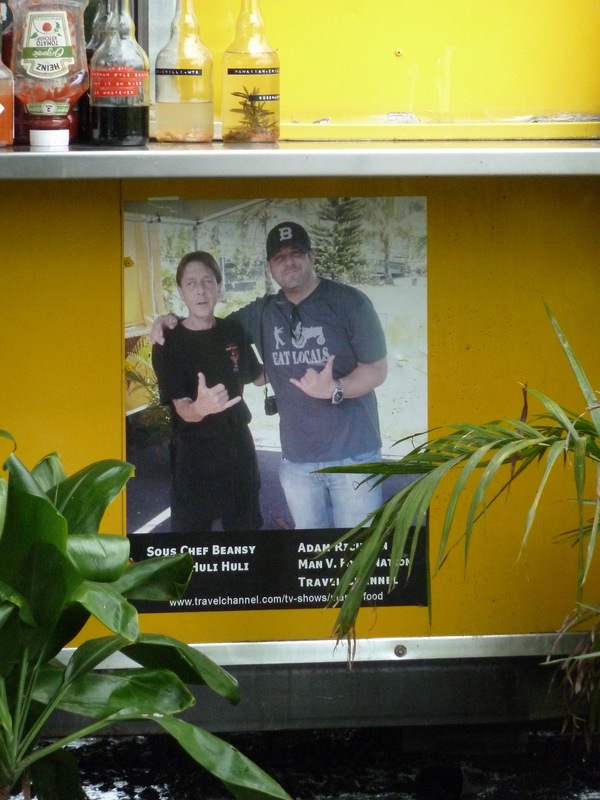 It was featured on Man Vs. Food and you can see the picture of Adam Richmond on the side of the truck, posed with quite the character, Beanie a Boston native. That Beanie was hysterical! He took our order and then gave us all kinds of suggestions on how to eat the food and then he hung around while we ate talking to us. He brought up the Boston bombing and what he and his "boys" would have done to them if they got their hands on them. Haha. He was crazy! The food was amazing!! If you're going to do food trucks, I highly recommend going to Giovanni's and Mike's- skip Macky's. Matt ordered the chicken and shrimp plate- the shrimp was just as good as Macky's. I got the pork and chicken plate, but rather than salad like Matt got, I chose macaroni salad instead. The food was AMAZING. There were many other options too. They had steak, hoagies, tuna, mixed frozen drinks... Really a must try- cash only. 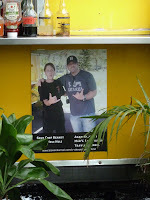 Now this is not near all the other food trucks of the North Shore. This truck is on the eastern coast, if I had to guess, about 20 minutes or so from Diamond Head. I highly recommend this place and hopefully you get to meet Beanie. While at Mike's, they gave us suggestions on beaches to try, but Beanie was the one to tell us that he saw the weather report today and that it wouldn't be a good day for the surf. We decided to go a little bit further up north to try the beach they suggested- it was flat as glass. We sat there for a while trying to decide if we wanted to venture back up to the North Shore or just head back and enjoy our time at Waikiki. We decided to head back and on the way stop at the blowhole and Sandy Beach. We got to Sandy Beach (the real one, not the movie one) and found a place to park. This beach was packed with locals and not another tourist in sight. Our first parking spot but us right next to a van full of young guys smoking pot and were pretty blatant about it. We were feeling a little uncomfortable especially since from the second we were out of our car, they were silent. They never spoke again the whole time we were messing with our stuff. Matt decides he'd feel better if we move away from them, so back in the car to the other side of the parking lot. We got ourselves a spot on the HOT beach, it was the heat of the day, 2pm. Once there and situated Matt realized that there was a lot of rock at the shoreline so he wanted us to move (quite a ways) down the beach. I was so hot and felt like I had gotten too much sun already, so I told Matt I'd put the stuff in the car and wait there since he said he wouldn't be here long. As Matt crutched his way down the beach I started to load up our stuff and immediately felt uncomfortable. No one said anything, but you could kinda feel that we weren't welcome and the stares were making me nervous. I decided it'd be better if I stayed with Matt, so I trekked across the hot sand to where Matt was. The crowd over there was a little better, so I felt comfortable. The beach was pretty there were some surfers to watch as well as these wake boarders that were doing some crazy moves! Every time I tried to get a picture or video the waves wouldn't cooperate, so you'll just have to trust me- they were awesome! They'd ride the think water at the edge heading towards to water and when they hit a wave they'd flip in the air off their boards. It was really impressive. These were all locals and they were younger guys- maybe college aged. Once Matt had his fill of the ocean, we headed over to the lookout for the blowhole and Sandy Beach (the one from the movie). The blowhole was not...blowing? The tide was just not cooperating. I overheard a local telling their friend that they had never seen Sandy Beach so calm. It was calm. Matt and I would have loved to go down and swim but the path is not quite crutches friendly. So after a few pictures, we headed out. We hit a little bit of traffic heading into Waikiki from the east at around 3pm. Nothing terrible, by any means. I think me being from NY and Matt being from NJ, we're kinda used to much worse. We also have been timing it pretty good too. It didn't take us long at all to get back to our hotel. 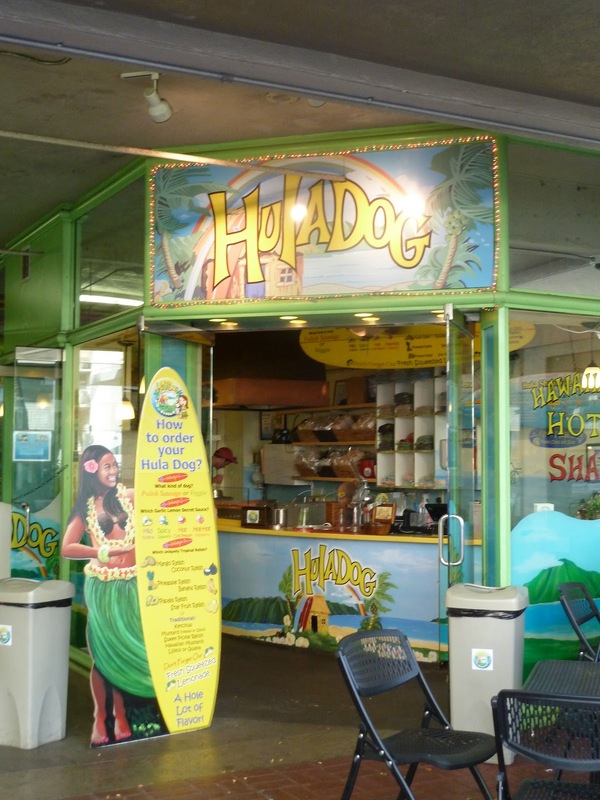 Matt iced his knee and then we headed for an early dinner at Puka Dog-which is actually now Hula Dog, Puka Dog is on Kauai. It's the exact same thing, just the owners split ways so one got a new name. It was exactly as I remembered it 4 years ago. You can see them featured on Anthony Bourdain's No Reservations. Matt got the bacon taro bread, polish sausage with the hot garlic lemon secret sauce, pineapple relish and the guava mustard and the fresh-squeezed guava lemonade. I ordered the white bread, polish sausage, mild garlic lemon secret sauce and the mango relish and I got a passion fruit lemonade. It was so good! Matt couldn't believe how much he liked it. I won't go into how they make them, google it, but it's a really great idea and Matt want's to open one in NY. After our early dinner we walked thru the soon-to-be-no-more International Marketplace and shopped a little. Then we crossed the street and picked up just two more items for loved-ones back home. I really haven't done that much shopping at all and nothing for me. Well, Matt did pick out some of those shortbread cookies for "us". After our shopping we were headed to Yard House for some dessert but we got suckered into a whole Dead Sea minerals demonstration. Normally, we're both very good about totally avoiding them, but this girl was sneaky and got us. Before I knew it I'm sitting in her chair getting lotions splattered all over me and trying to be convinced that she is giving me a secret deal, that is costing her boss to loose over $250 dollars, because "she likes us so much" and her manager is not around. Whatever, lady. She would not take no and Matt was getting angry. It took us quite a few stern "no thank yous" to get me free of her throne of lies. While sitting in that chair, I wanted to yell to all the passer-bys, "Really, I'm not a sucker!! I know better!". Instead I just sulked listening to her endless speech and lies. After out of her clutches, we finally headed to Yard House. It was only a 25 minute wait, so we got a bench and smoked weed- second hand style, until we realized what was going on and moved to another bench. I can't believe how openly people smoke pot anymore. It's sad. We finally made it into Yard House to feed our now unwarranted munchies with some amazing desserts. Matt ordered the Salted Caramel Butterscotch Pudding that he loves and I finally got to try the S'mores Brownie- it's HUGE!! 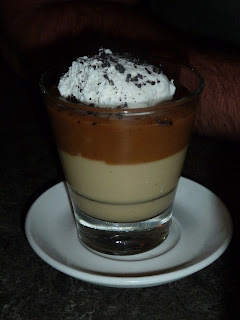 Both desserts were great, service there is very slow. You've been warned. After our dessert we decided to head back to our room, because our lanai (balcony) had a perfect view of the 9pm fireworks that go off from the Hilton Hawaiian Village every Friday night. We were sound asleep almost immediately and we totally missed the fireworks. When we woke up this morning (Sat- when I'm typing this), Matt was still completely dressed. Is it still a hard to find place in that tiny mall?